Once you’ve learned a few strumming patterns and you’ve got to grips with a handful of chords you could just stop there. It would be enough to get you through a huge list of songs. If you listen to any professional musician playing an instrument, you’ll quickly notice that it’s the embellishments and little additions they make that really sets their playing apart. Let me start by saying that this is a tip that works better with barre chords. It’s less effective with open chords (chords that have unfretted strings), particularly those that leave 2 to 3 strings unfretted. It’s quite easy to slide in to a chord. For the purpose of this lesson we’re going to use D7 as our example. The D7 chord is barred at the second fret (use your index finger) then also fretted on the third fret of the A string (second finger). In order to slide into that chord we need start by fretting the chord a fret closer to the nut than we normally would. With our D7 chord, that gives us a Db7/C#7. Have a look at the chord boxes below if you need a little help on how to form these 2 chords. You have 2 options here. Either fret the chords as normal and slide the whole shape back by a single fret or just apply it a fret lower to begin with. 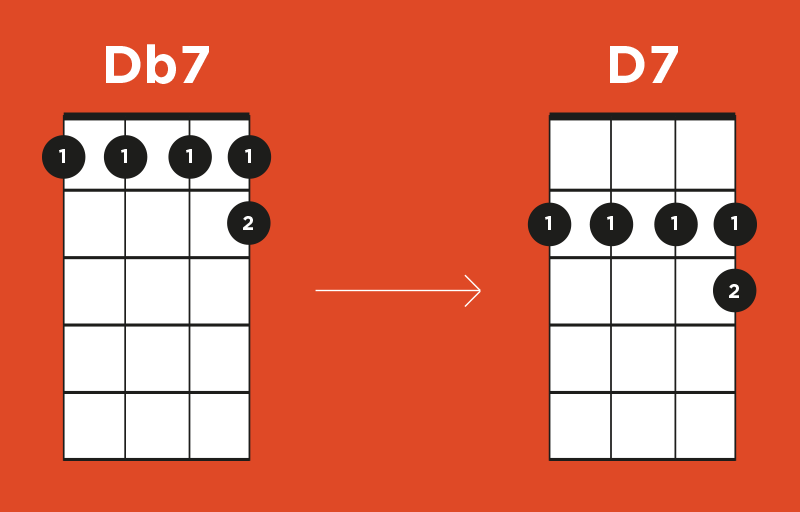 For our D7 chord this would mean barring at the first fret and then picking up the second fret of the A string (bottom) with your second finger. Now you have the chord fretted in the correct position, strum the ukulele and slide the whole shape up by a fret. You’ll need to keep the pressure on as you do this. Try it a few times, it takes a little getting used to. If you find that the chord doesn’t ring out as you slide it up you’re probably not keeping the pressure on quite enough. Once you can comfortably slide in to a chord, you’ll need to work out how you can throw this into a rhythm and keep the timing. I like to start by strumming and sliding on the first beat and letting the motion take up half a beat. If you’re counting out your rhythms (and I’d highly recommend it) this would mean that you’ll be counting 1 &. 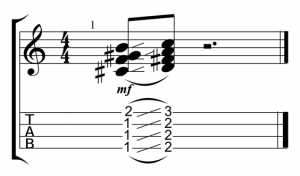 This leaves the second beat for you to play a second strum, but we’re not going to worry about the second strums here. We’re just focussing on getting that slide sounding good and taking it to a point where we can drop it in as we need it. In the video above, I go a little bit crazy and play an awful lot of slides to show what you can do. I’d recommend using them sparingly though, the more you throw into your songs, the less impact they will have. Pick a song you know really well and throw a couple of slides into the mix, see if you can find a great point to drop it in. Have an experiment and most of all have fun with it! I’ve never seen that g chord shape before. What is it? Thanks for getting to this one before me Frederic! Neither had I, and this slide stuff is really effective. Thanks!